Alongside a collection of photographs filmed in colour, the author has added a series of carefully chosen thoughts and quotations that describe the beauty and language of flowers. - Publisher Flower photography combines with carefully crafted text and quotations to makes a thoughtful gift that will inspire anyone. 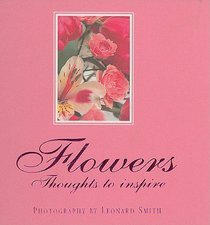 About "Flowers: Thoughts to Inspire"
Flower photography combines with carefully crafted text and quotations to makes a thoughtful gift that will inspire anyone.